...but they discover evidence that points to a high-level conspiracy. I was half asleep when I watched this, and cranky, so I just wanted to smack Susan's husband's gape-face when she told him about her war service. Dude, your wife is smarter than you by far, deal with it. What did he say in the taxi on the way home, something about taking the kids with them to his new posting and she could home-school them? I didn't think this mystery was terribly mysterious; I think it mostly served to get the new character on board as (I assume) the actress playing Susan wanted to move on. 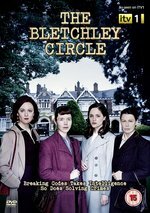 This series had real potential though, shame it couldn't have had the attention devoted to Foyle's War.